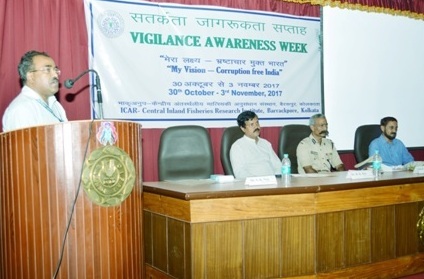 The Vigilance Awareness Week-2017 with the theme “My Vision – Corruption Free India” was observed at ICAR-Central Inland Fisheries Research Institute (CIFRI), Barrackpore from October 30 - November 04, 2017. 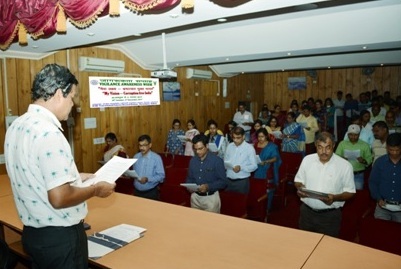 On the first day, Integrity pledge was administered by Dr. B.K. Das, Director to the staff members of the institute. 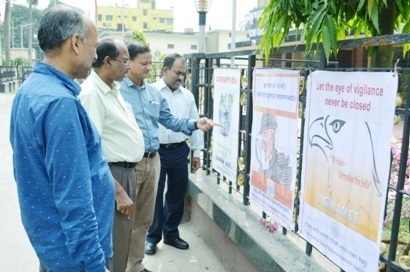 Different slogans/posters depicting the evils/ill effects of corruption on the society were displayed in the institute premise. On 31-10-2017, essay writing and extempore competition was organized among the staff and research scholars. As outreach reactivity, students of Class XI and XII from different schools were invited to participate in essay writing, cartoon and poster drawing competition held at the institute on 01-11-2017. 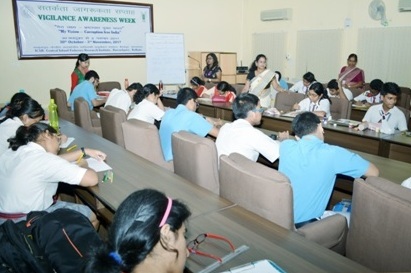 Total 30 students from four schools participated in the competition. 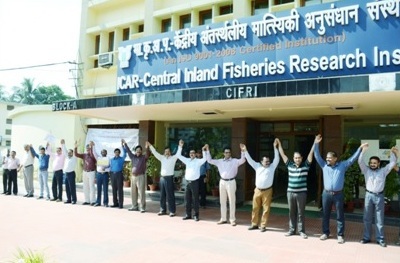 On day 4 (02-11-2017) the staff of the institute formed a human chain symbolising togetherness in fighting corruption. 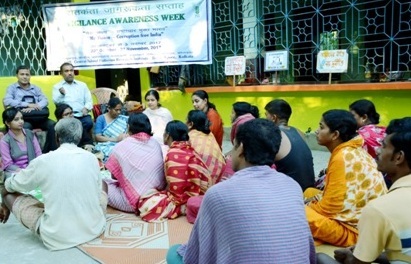 A road march was also organised to create awareness among the public on corruption and its effects On the same day, as part of outreach activity to spread the message among the rural population, a gram sabha was organised in the Village Ariala at Barasat-1 block of North 24 Parganas district wherein many farmers and villagers participated and actively took part in the discussion. On 03-11-2017 the concluding programme was held under the chairmanship of Dr. B.K. Das, Director. In his welcome address Director highlighted various measures initiated to promote accountability and transparency. Dr. S.K. 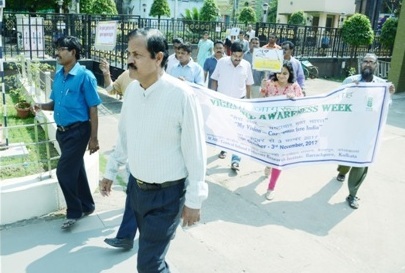 Nag, Vigilance Officer of the institute gave an account of various in-house and outreach activities undertaken to observe the week. 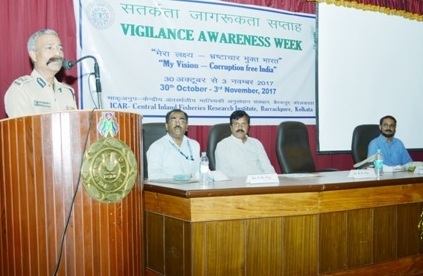 Shri Rajeev Lal, Chief Administrative Officer gave a power point presentation on vigilance, corruption and various measures taken to prevent corruption at the institute. 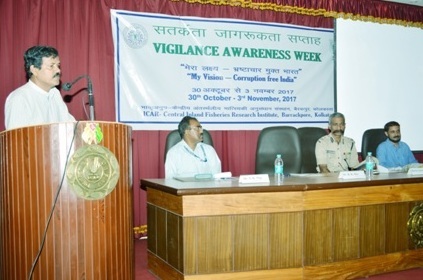 Shri K. Jayaraman, IPS and Director of Swami Vivekananda State police Academy (SVSPA), West Bengal was the Chief Guest who delivered a inspirational talk on the matter of corruption and vigilance. Chief Guest also distributed prizes to the school students and CIFRI staff who participated in different competitions.